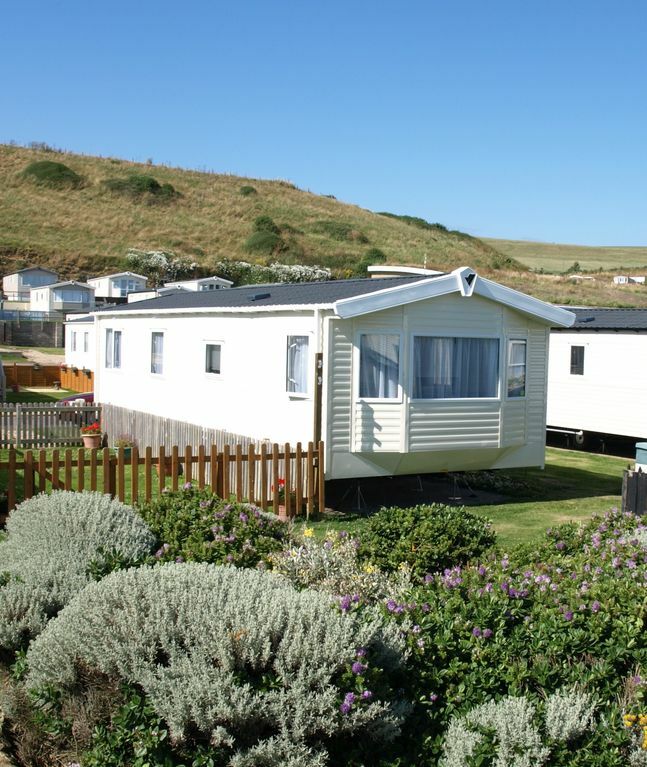 This two bedroom static caravan is situated on the spectacular Jurassic coastline at Freshwater Beach Holiday Park. With double glazing and central heating throughout this caravan comfortably sleeps six with both en suite and family bathroom, well equipped kitchen with microwave and built in fridge freezer and a spacious open plan lounge/dining area. Ideally situated within easy reach of the lovely private beach (where 'Broadchurch' was filmed! ), indoor and outdoor swimming pools and the Jurassic Fun Centre entertainment complex with Ten Pin Bowling, Gym, Jacuzzi, Sauna and Hair and Beauty Salon. We love to receive a review and know that our visitors have enjoyed their stay with us so thank you for sharing. The site is fantastic and being close to the beach is a bonus. Ideal for an early morning stroll, it certainly takes some beating. Look out for the new outdoor pools that will be ready for the start of next season! Beautifully equipped van, minutes from beach, entertainment & shops. Very comfy and so nice to have a garden to sit in. Thoroughly enjoyed our stay. Thank you for the review. It is always great to hear that guests have enjoyed their time at our caravan and the site. This was a “recharge the batteries” holiday for me. The accommodation has all the facilities you could ever want and was very cosy. I felt very much at ease there. I loved falling asleep to the subdued sound of the waves on the beach. As I am approaching old codgerism I spent the mornings lounging, but then it was satisfying to be able to make it over the hilly coastal path to explore Burton Bradstock and return one afternoon. Then to West Bay the next day, returning by the local bus. The property is of course ideally placed for this. I then finished each day with a trip to the Park pool. Batteries recharged, thank you! It's always good to receive a positive review and know that guests have enjoyed their stay. Even though the weather wasn't brilliant it seems that you made the most of the area and all that it has to offer. The property was beautifully decorated, clean and well stocked with snacks, thank you. Carole was a delight to deal with. The location was perfect for us. The onsite bowling centre was a bonus! We always appreciate that visitors take the time to submit a review and love it when those visitors have enjoyed their stay. The best stocked & cleanest caravan we have ever stayed in! We were privileged to recently stay in this lovely caravan. Carole stocked the cupboards and fridge with all the essentials we could ever need. The milk was gratefully received having arrived on site after the Spar shop closed. The caravan was right next to the beach. We even had lots of rabbits coming to visit us! The campsite was very clean and quiet. We made use of the free swimming in the outside and inside pools. Both were actually warmer than our local swimming baths. My son loved the water slide and play area. We also enjoyed a game of ten pin bowling on site! Carole very kindly went out of her way to find out some information for us which we were really grateful for. The only negative was that we couldn't stay longer! My son wished that he could stay forever! Will definitely be back again next year. Thank you so much again for a really lovely relaxing holiday. It is always good to receive a review and we love to hear that our guests have had a fantastic time and enjoy our holiday home just as much as we do ourselves. We appreciate that guests take the time to give us a review and would love to welcome you back in the future. Second visit, and even better than the first !! Thank you for all the lovely touches. Immaculately clean and tidy. A small suggestion, some hooks in the bedroom to hang towels on would be very helpful. We love to receive a review and especially when guests have enjoyed their time in our caravan. We will take on board your suggestion and ensure that hooks are added in the best possible positions. No Smoking. No Bed Linen or Towels provided. Check in from 3pm. Check out by 10am.